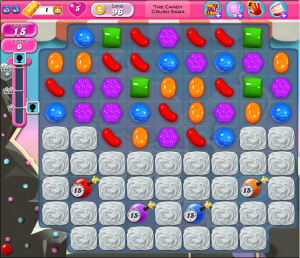 Candy Crush Level 96 introduces a new variable to the mix. Bombs! They aren’t as annoying as chocolate but they can be a pain in their own way. Follow these simple tips and you can beat this level without setting off any bombs. On Candy Crush Level 96 you are given 15 moves to score a minimum of 15,000 points. This can easily be done if you just stick to breaking up the meringue and focus on making big combos. Special candies will help you reach the score minimum quicker and will destroy more meringue simultaneously. Understanding how the bombs work is the first key to beating candy crush level 96. First of all, the bombs aren’t meant to be BLOWN UP. Like most timed bombs, once they reach zero “0”, they blow up. So the whole point is to make a basic combo with the bomb to destroy it safely. Think of it as disarming the bomb. Also, when combining the bombs for a basic combo, you get 3,000 points compared to the 60 points you would normally get. This is a good way to get more points and reach the score requirements. 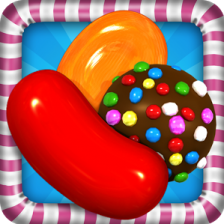 The best way to beat candy crush level 96 is by making special candy combos. You have a big board that gives you plenty of space to make special candies so this shouldn’t be a problem for you. Once you make special candies, you can use them right away or try to combine them with another special candy. If you only have a few moves left, it might be smarter to go ahead and use the special candies single handed. You will still get plenty of point and easily should reach the score minimum. *There are 4 bombs that each give you 3,000 points. That’s 12,000 points all together so all you have to do after destroying the 4 bombs is get another 3,000 points to beat the level. You should be able to manage this. If you are still having trouble beating Candy Crush Level 96, try watching the video walkthrough or just comment below and we can help you out! Level 96: I play on a tablet. It said I need 10000 points in 15 moves. I scored 31000 with 5 moves left, it showed 2 stars+, AND THEN it said I didn’t reach the goal! ARGGGH. I see. You ALSO have to knock out all the bombs. But they don’t tell you that.